Perception Analyzer Online pinpoints reactions at an extremely nuanced level, so when your sample group reacts strongly to something, it really pops out at you. If you take a survey and see fixed answers like “Somewhat Disagree” and “Somewhat Agree,” it’s safe to say the researcher isn’t getting your entire opinion. Detailed feedback requires tools that can register nuance, and until now, respondents and researchers have had to make do with rigid recording mechanisms. Today that stops, with the unveiling of Perception Analyzer® Online; Dialsmith’s® new interactive survey platform that tracks the moment-to-moment opinion spikes that researchers need to make informed decisions. Click here for a demo. With Perception Analyzer® Online, standard and interactive question formats are paired with dynamic tools like second-by-second video evaluation. The unique nature of the system engages the respondent far better than traditional methodologies, and allows researchers to collect data down to a granular level. For example, by continuously moving Perception Analyzer Online’s slider technology while a video plays, a respondent’s opinion can be measured to the second. This allows researchers to graphically see how the respondent was feeling at all times, and substantially shortens the path to indicative findings. Now, any strong feelings a respondent has about specific people, words, phrases, images, and scenes are able to easily be determined and capitalized on by professionals working in media, market, political, advertising, public opinion, and television research. Political Messaging: Assess the impact of key messages, policy initiatives, and overall delivery of speeches, debates and presentations to aid in developing strategic plans and language that will connect. Political and Consumer Ad Research: Testing content and messaging iterations online is faster, more cost effective, and allows for larger sample sizes than live focus groups. TV Pilot and Movie Trailer Testing: Enables studios, producers, and marketers to gauge how viewers connect with each character, theme, and scene in trailers and TV pilots so critical refinements can be made prior to airing. Product Packaging, Design, and Pricing Evaluation: Test reactions to different colors, shapes and styles attached to products and their packaging as well as find the optimum price point to maximize revenue and profit. Brand Messaging: Analyze reactions to corporate speeches, branding concepts, sales presentations, and messaging at an internal and external level. The Perception Analyzer dial technology has been serving the market, media, and political research industries around the globe for more than 25 years. Originally developed for focus group settings, the continuous feedback offered by the offline dial has been reimagined to allow for online second-by-second feedback to video material. Now, standard online survey questions can be combined with the power of moment-to-moment video evaluation and interactive question types to give researchers deeper insights, and respondents a more engaging survey experience. Those benefits lead to increased survey completion rates, data collection at a granular level, and more informed decision-making. 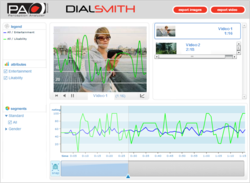 Dialsmith® is the exclusive worldwide developer and marketer of the Perception Analyzer® and Perception Analyzer® Online, interactive technologies that helps researchers and presenters understand their customers and audiences more clearly. The Perception Analyzer tools are used around the world to test marketing strategies, advertising campaigns, television programming, political candidates, public policy issues, and much more. Trial Consultants use the tools to evaluate witness testimony and attorney presentations. Event producers and presenters incorporate the Perception Analyzer into their programs to engage audiences, evaluate ROI, and make learning more interesting and fun. Television networks, such as CNN, MSNBC, Fox News, and CNBC, use the Perception Analyzer dials to display real-time focus group and commentator feedback on air during broadcasts of political speeches, debates, and news conferences. Sports properties, such as Street League Skateboarding™, use the Perception Analyzer's sister brand, ISX – Instant Scoring eXperience™, to conduct instant judging and scoring for live and televised sporting and reality events.